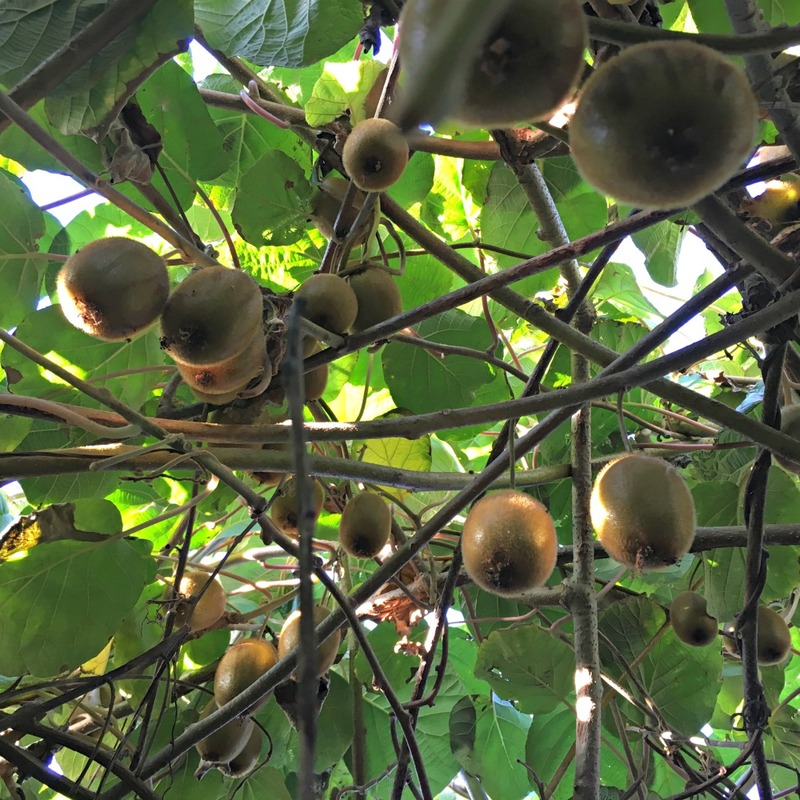 Visiting a garden in Seattle many years ago, I saw my first kiwi plant. It had climbed over the top of a pergola and made a lovely roof to sit under. The leaves were broad and vibrant green, very tropical looking to me. The vine was blooming and the smell was intoxicating. I had to have one! Coming home with 4 plants that day, my adventure with fuzzy kiwi’s began. 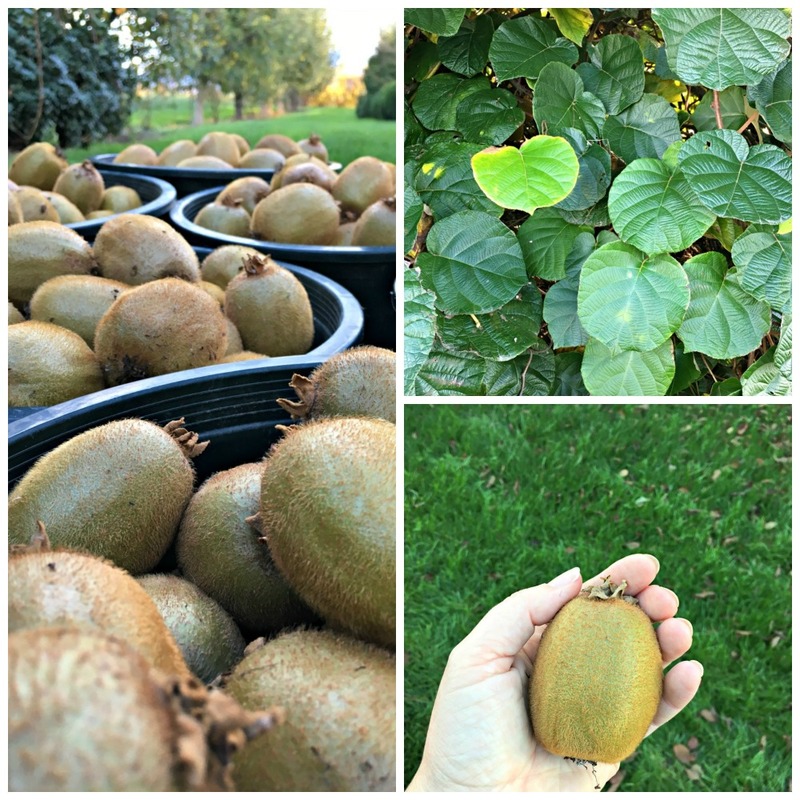 When people hear I grow kiwi’s, they can’t believe it. First of all, they think they are tropical and couldn’t possibly grown in the Seattle area. But they are originally from China and grow beautifully in our climate. Secondly, they know how they grow. They look around my yard at my trees, thinking they grow like apples. Nope, they grow on vines. And not just any vine, but vigorous monster vines that consume anything in their path. I’ve had to move them twice and re-trellis them several times, as they crushed my original posts with their weight. Like grapes, the vines turn woody after the first year. You can’t see the fruit, as it grows underneath the vines and hangs down on stems like dangling earrings. Because of this, I’ve found it best to create a trellis I can walk underneath to pick the fruit. The vines have grown over the edges of the trellis, creating a round mound of greenery. But if you part the vines and step inside, there is a wonderland waiting for you. A secret room, full of kiwi’s! Harvest begins late October, once our nights get cooler. I try to wait for a frost, to set the sugars. I’m a bit late this year in harvesting them but they are still fine. A few kiwi’s have bite marks in them from field mice, which is usually a sign they are ready to eat. 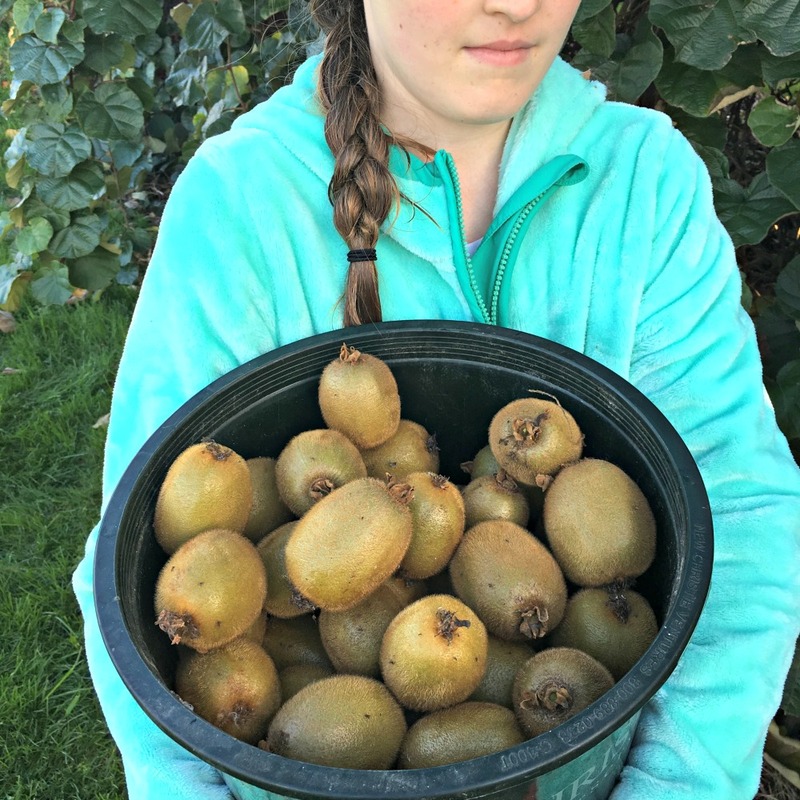 And, as usual, there are more kiwi’s then we can pick. We fill buckets full of brown fuzzy fruit, probably getting 20 gallons or more. And they are huge, much larger than the ones you find in the grocery store. 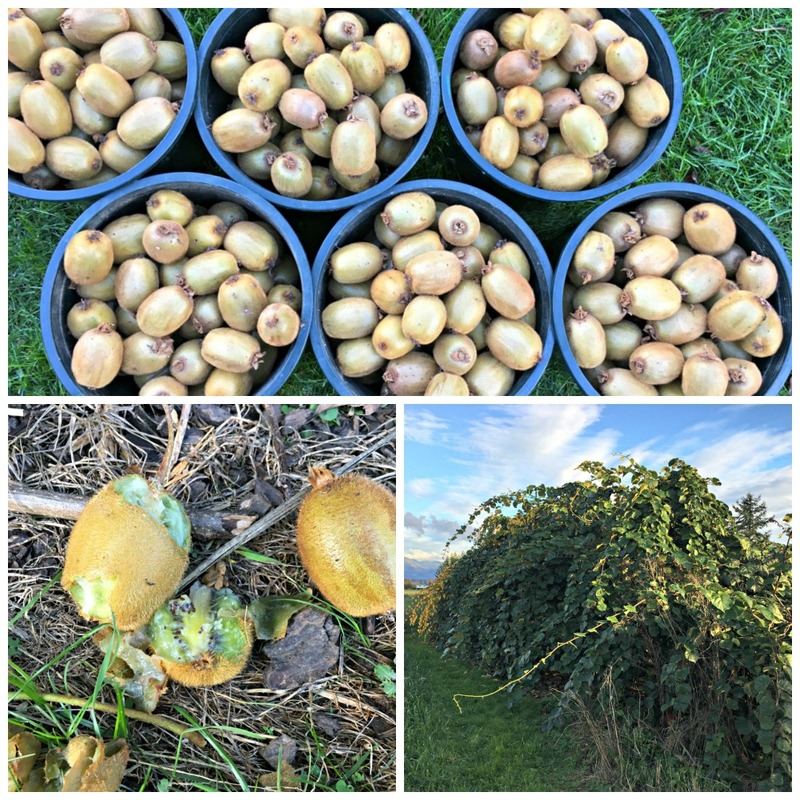 The kiwi are still not ripe, though. I’ll bring a few into the house and they will ripen in a few weeks. The rest I keep in a refrigerator until I am ready for them. 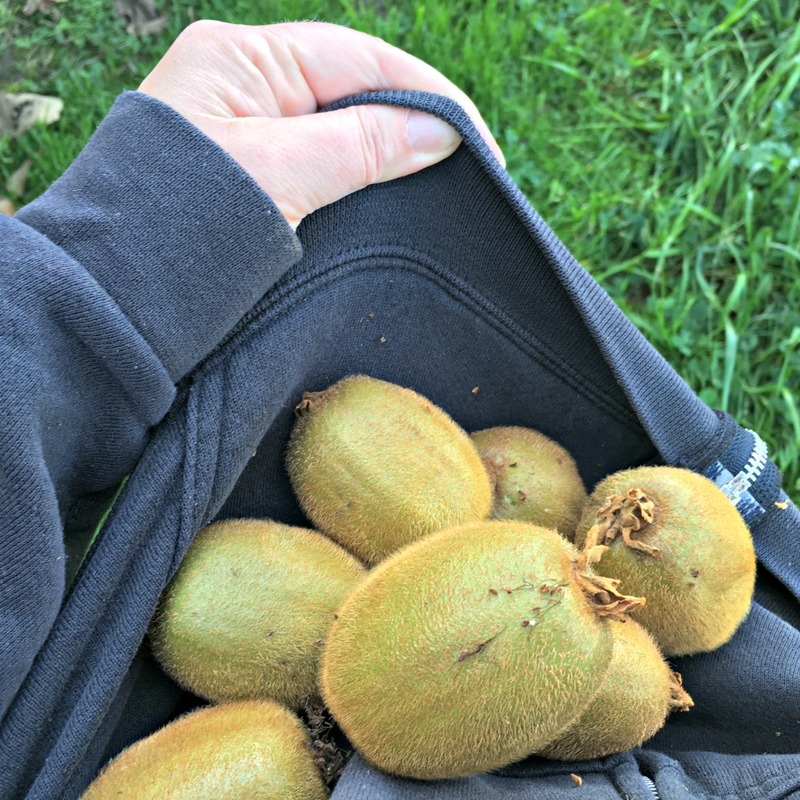 Yes, I have a spare refrigerator in my barn for just this purpose, to store kiwi. Doesn’t everyone? They will last several months this way, if I keep them cold. I need to find some recipes of things to do with kiwi’s, though. One friend suggested making liquor, which sounds like a fun idea. If you have any recipes for me, please send them my way!